Growing up on the West Side of San Antonio, Amelia “Amy” Nieto (B.B.A. ’89, M.P.A. ’97) remembers summer evenings riding her bike from her childhood home on Marquette Street to the St. Mary’s University campus, waving to Brother William J. Hamm, S.M., on his nightly runs. “St. Mary’s was my backyard,” Nieto said. Her parents encouraged a Catholic education, enrolling Nieto in Holy Rosary School, where she first met Sister Gretchen Trautman, F.M.I., her former kindergarten teacher, current provincial of the Marianist Sisters and friend to this day. During her undergraduate years at St. Mary’s, Nieto participated in volunteer projects, but her love of service began many years before, inspired by her father, a civil servant who would donate to schools and organizations while visiting Panama, Mexico and elsewhere. “It ignited something in me,” she said. Nieto felt empowered to give back. She began a career in nonprofits and fundraising with positions at the American Heart Association and San Fernando Cathedral. Nieto’s service-oriented goals eventually led her just down the street from St. Mary’s, to the Archdiocese of San Antonio, and then back to St. Mary’s. 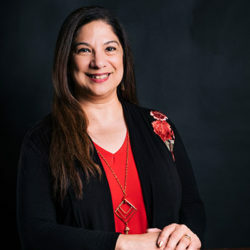 While working on her Master of Public Administration, Nieto began to understand how important the Marianist Charism was to her personal and professional goals. After graduation, Nieto made a habit of donating each month to support scholarships. Seeing the campus grow before her eyes inspired Nieto to give back. She believes even the smallest contribution, whether it be “your time, talent or treasure,” greatly benefits students.